Review posted September 2, 2016. Balzer + Bray, 2015. 345 pages. I read this book because it won the Printz, and probably would have given up otherwise. This book contains magical realism, which isn't really my thing. I like fantasy that makes logical sense. I know that sounds silly, but I like there to be logical rules to the magic and a reason for the magic to exist. This is much more free-form, with gaps. However, the writing is beautiful. I came to care deeply about Finn and the people around him. The people of Bone Gap called Finn a lot of things, but none of them was his name. When he was little, they called him Spaceman. Sidetrack. Moonface. You. As he got older, they called him Pretty Boy. Loner. Brother. Dude. But whatever they called him, they called him fondly. Despite his odd expressions, his strange distraction, and that annoying way he had of creeping up on a person, they knew him as well as they knew anyone. As well as they knew themselves. They knew him like they knew that Old Charlie Valentine preferred his chickens to his great-grandchildren, and sometimes let them roost in the house. (The chickens, not the children.) The way they knew that the Cordero family had a ghost that liked to rifle through the fridge at night. The way they knew that Priscilla Willis, the beekeeper's homely daughter, had a sting worse than any bee. The way they knew that Bone Gap had gaps just wide enough for people to slip through, or slip away, leaving only their stories behind. Weeks before the story starts, Roza slipped away. Finn is the only one who was there. He knows a man took her away, and Finn didn't stop him. Finn was confused. He thought she wanted to go with the man -- until it was too late. Until he saw her hands slapping at fogged glass and the gleaming black SUV was swallowed up by the gathering dark. And then he wasn't able to describe the man. Finn told how he moved, what he was like. But that isn't enough. Everyone is angry with him, and no one really believes Roza didn't just decide to leave as mysteriously as she arrived. Finn's brother Sean, especially, thinks that he's been left again. He doesn't believe Sean that Roza wouldn't do that, that Roza is in trouble. If there was a man, why can't Finn describe him? The chapters about Finn and Sean are interspersed with chapters about Roza in her strange surreal captivity. The man keeping her can speak flawless Polish and can effortlessly change where he's keeping her. 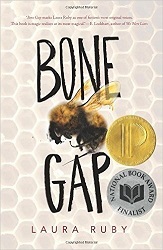 Finn has a lot to learn about himself, about Bone Gap, before he can find Roza. And Roza has an important part in her own rescue. There are shades of the story of Persephone here and plenty of atmospheric paranormal elements. I should mention that I like the way very realistic elements were woven into this mythic story. Finn has a good reason for his troubles describing the man who took Rosa, and Sean has good reasons for not trusting people. I like the way magic and reality are beautifully woven together in this lovely book.